If you’ve got a preschooler or early grade schooler, then the topic of dinosaurs probably looms large in your household. Let’s face it — dinosaurs are fascinating, in part because they are fantastic beings that, unlike fairy-tale dragons, really did exist. From the time of the first exhibition of dinosaur sculptures at the Crystal Palace in London in 1854, these Mesozoic beasts have captured the imagination of kids and adults alike. Increase your “cool quotient” with your own kids this summer by taking some Jurassic Journeys close to home. Worlds of Fun (Kansas City) is ramping up its edutainment value this season with its brand-new, immersive and comprehensive Mesozoic experience: Dinosaurs Alive! Step back in time to encounter over 35 life-sized (and very lifelike), animatronic dinosaurs, complete with thrashing tails. Some of the exhibits feature interactive consoles, so that with the push of a button, your child can make his favorite dinosaur roar to life. 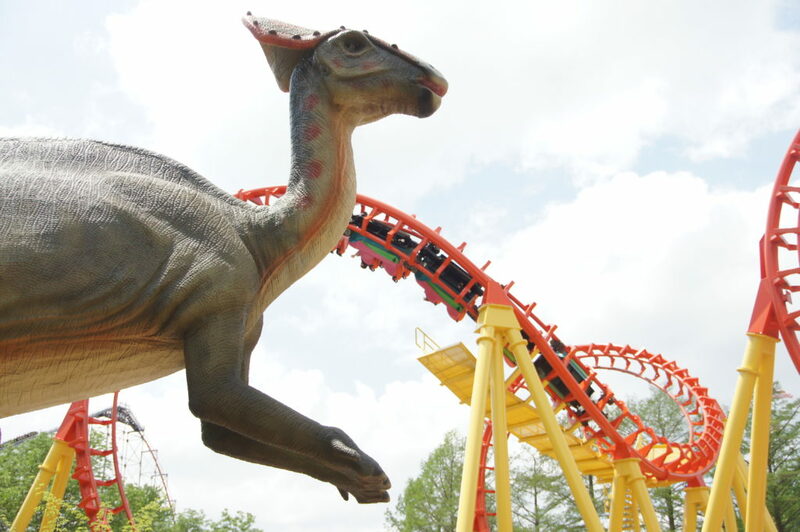 Step back in time to encounter over 35 life-sized (and very lifelike), animatronic dinosaurs, complete with thrashing tails, at Worlds of Fun with the amusement park’s Dinosaurs Alive! experience. 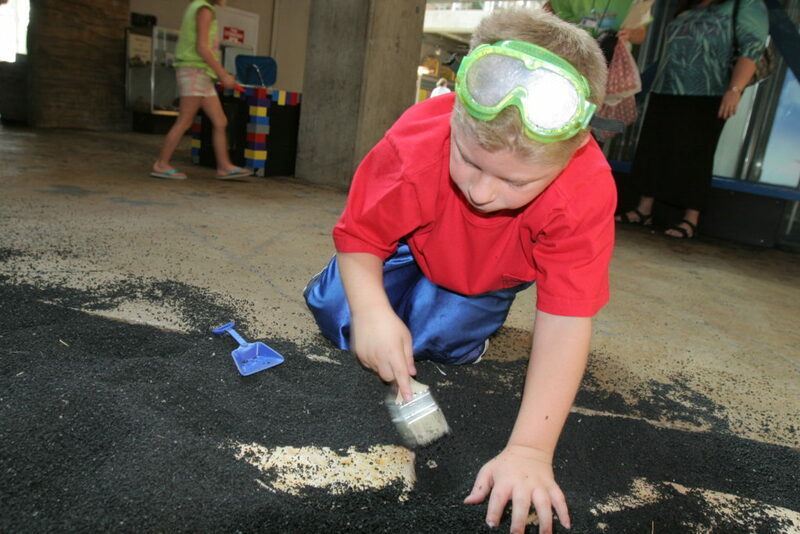 A young scientist uncovers more evidence that dinosaurs existed at DigSite in the DinoLab in Science City. Dinosaurs come to life at the 20,000-square-foot T-Rex Restaurant at Village West near Kansas Speedway. The outdoor setting enhances the experience. Along a winding 1,900-foot path tucked in a two-acre forested area, different scenes in this prehistoric-themed world tell stories about how dinosaurs interacted with each other, based on real fossil evidence. Despite the fact that you’re in the middle of a modern-day amusement park, you’ll feel as if you’re on a perilous trek taking place between 65 million and 245 million years ago. The highlight of Dinosaurs Alive! is the world’s largest animatronic dinosaur, the Ruyangosaurus, standing at nearly 40 feet tall and 72 feet long. Other featured creatures include the Tyrannosaurus rex (stalking a Triceratops), the Stegosaurus and the long-necked Brontomerus (a species named in 2011 and unique to Worlds of Fun). For the small fry, there’s a paleontological dig site where kids can unearth fossils. A separate $5 admission ticket is required to visit the attraction, but the experience is well worth it. For more information about Worlds of Fun and for tickets, visit worldsoffun.com. Science City in Kansas City’s beautifully-restored Union Station has always been a great place to while away summer afternoons, but dinosaur-mad families can now catch a paleontologist in action at DinoLab, one of the country’s largest fossil prep labs available for public viewing. The 1,700-square-foot lab is also the first to show the entire scientific process of preparing actual dinosaur fossils for exhibition. The cleaning and restoration of Lyle the Camarasaurus — from the delicate work of extracting bone from rock, to pouring plastic replicas — is on view for curious onlookers. It’s particularly interesting to watch how the scientists preserve dinosaur bones. Hands-on activities for guests inside the lab include handling real fossils and observing them under a magnifying lens. Outside the lab, young visitors can grab goggles, shovels and brushes, and dive into the (sand) DigSite themselves to uncover the fossil remains of Mosasaurs and Pterosaurs, as well as ferocious Mesozoic fish and other ancient ocean creatures. DinoLab is the result of a partnership between Union Station and Kansas University and its Natural History Museum here in Lawrence (which is also well worth a visit, with its 45-foot Mosasaur that looms over the lobby and an extensive collection of fossils, including the femur of a Camarasaurus, which you can even touch). 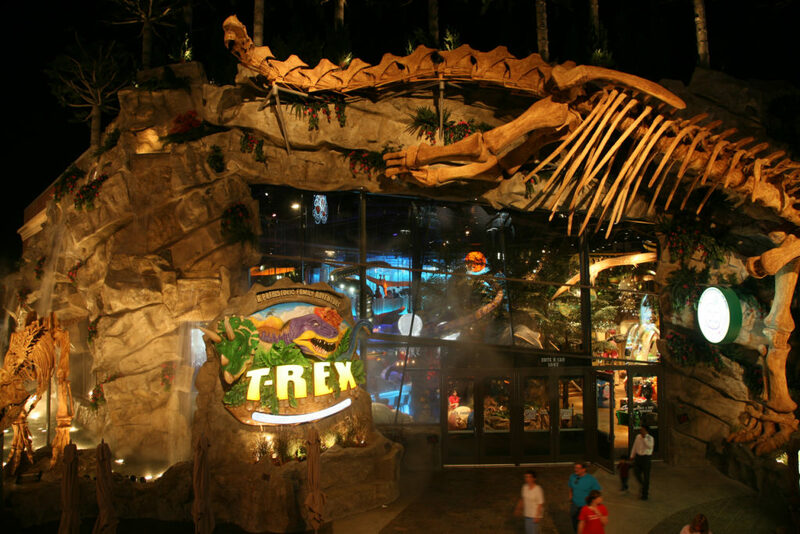 You can dine with dinos at The T-Rex Café at The Legends Outlets in Kansas City. The themed restaurant features life-size animatronic dinosaurs that come to life among waterfalls, ice caves and aquariums (sometimes featuring human divers). Menu items cooked in the “Kitchen of Fire” include the Triassic Tortellini, the Bronto Burger and (for Giganotosaurus-sized appetites) the 18-ounce T-Rex Bone-In Rib-Eye. The Kitchen features a wood-burning pizza oven and a rotisserie surrounded by live flames. Adults can enjoy their own special Caveman and Cavewoman drinks, such as Raptor Rita, a mix of Jose Cuervo Gold Tequila and sweet and sour, topped with Patron Citronge. After eating, your kids can continue their prehistoric adventure in the interactive Paleo Zone. They can excavate dinosaur fossils in Discovery Dig, explore a mine to find hidden treasures of the past and pan for precious stones and minerals in Discovery Creek. For a souvenir, kids can even make their very own “Friendosaur” at the Build-A-Dino workshop. They can choose one of nine different varieties of dinosaur, then give their new friend a heart, stuff him or her with fluff, and finally select an outfit from an assortment of prehistoric fashions.